In a career that has spanned more than half a century, C Vann Woodward has come to be regarded as one of the foremost historians of the United States. His writings on the South -- particularly on the period of the New South -- have inspired the admiration and awe of more than a generation of colleagues and students. Thinking Back is Woodward's retrospective view of his experience as a historian. Neither a personal nor an intellectual autobiography, it is a book in which Woodward describes -- through a consideration of his own books and the critical dialogue they have engendered -- how the history of the South was viewed and written during the early years fo the century, how those views hve changed over the decades, and the turbulent forces that have influenced revisions in interpretation, subject matter, and comprehension. Thinking Back is without precedent, a book thta could have been written by no one but Woodward himself.Woodward recalls the South of the 1930s, the formative period when the young man from rural Arkansas determined the course his life would take. He describes his university years at Emory and Chapel Hill (where he finished his first book, a biography of Georgia Populist Tom Watson), his early mentors, and the early misgivings he had about a career as a historian. He remembers the honor he felt on being asked, at the tender age of thirty, to write one of the volumes in the prestigious series A History of the South. That book, Origins of the New South -- more than twelve years in the making -- would become one of his most important contributions to southern historiography. Woodward describes his astonishment at the unexpected success of his seventh book, The Strange Career of Jim Crow, which was written in the summer months of 1954, just after the Supreme Court's unanimous decision in the case of Brown v. Board of Education of Topeka. He also relates the circumstances that, in the late 1950s, compelled him to write another of his more influential works, The Burden of Southern History.In each instance Woodward reflects on what he was trying to do in his books, what forces he was reacting against, what people events, and ideas influenced him, and how he now assesses his work. With candor and cordiality, he addresses his critics as colleagues rather than as adversaries, agreeing with some, debating with others, and venturing criticisms of his own work that they may have overlooked. He considers the perils of the historian as presentist, as ironist, as moralist, and as ideologue, and the risks of writing with conviction and passion on controversial subjects.Thinking Back is vintage Woodward. It is expertly crafted, admirably modulated, witty, and a delight to read. For readers of history interested in how the historian works, the risks he takes, the doubts that plague him, and the forces that move him, this book will have unique appeal. There is nothing else quite like it. 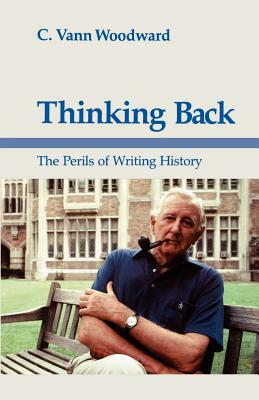 C. Vann Woodward (1908-1999) was Sterling Professor of History Emeritus at Yale University. He was a member of the American Academy and Institute of Arts and Letters and the American Academy of Arts and Sciences. He won the Bancroft Prize, the Pulitzer Prize, and many other awards.